Details relating to the Finnish Commemorative of 2014. 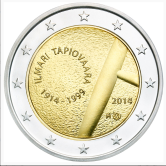 This coin commemorates the Finnish interior designer Ilmari Tapiovaara. Tapiovaara is one of the most prolific designers in modern Finnish interior design and the focal pont of his artistic interest was in the design of multi-purpose chairs. The motif – simple but elegant – shows, in the inner circle, a typical “Tapiovaara connection” of two wooden parts of a chair. To the left of the chair is a small circle formed of the name and years of birth and death. Near the edge of the inner circle around four o’clock are the year of issue, issuing country designation and mint mark. 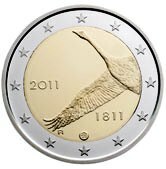 Return from Finnish Commemorative 2014 to euro coin collector.